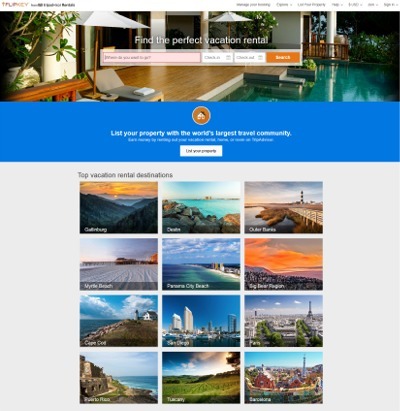 Which listing website should I list my vacation rental property on? Are you planning on renting a room within your home or an entire house or apartment? At the time of this writing Airbnb is the only popular home-sharing website in the United States where you can book a room. All of the other websites limit themselves to entire home listings. If your guest area is private, has a separate entrance and is fully self contained (guests will not share the kitchen, living areas or bathrooms with any other guests or your family) then you can normally list your home as an entire home. An example of this is a downstairs or upstairs apartment with a door leading outside to the parking area. You cannot list as an entire home and then expect to occupy any section of the home that shares areas with a guest. You can list your personal home if you are not going to be present. There are many hosts who stay with friends, relatives or even book a hotel room themselves in order to rent their home during special events in the community, thus earning extra money for a slight inconvenience. As mentioned, if your rental is only a room within your home then you will be limited to listing on Airbnb. Airbnb's main core customers are millennials. This middle age and younger population is out to see the world, normally at the lowest cost possible. They may travel in groups to reduce cost and try to squeeze several people into small homes. In our experience, most millenials seem to be conscientious and take care of a home however you should also be ready for an occasional nightmare, especially if you allow partying or large groups. In the past couple of years Airbnb has been able to expand its popularity into other demographics. Vacationing families trying to save money in order to have a bigger and better holiday are becoming more common. Also, older and less computer savvy folks are being encouraged to try this new experience by their millennial children who have shrugged of hotel stays. Over all, both of these groups tend to make good renters. Homeaway's clientele tends to be travelers with more expendable income, but looking for somewhere to spend the night that saves them money. Many hosts report that these vacationers seem to be more demanding and expectant. Trip Advisor and FlipKey are now operated by the same company. Typically the clientele from either of these websites is middle age and up and many are European and Asian travelers. Some of our best guests have booked on FlipKey and Trip Advisor, but we have also noticed that this group is more apt to give lower ratings when it comes time to review your property. Recently a myriad of competing websites attempting to cash in on Airbnb's fame have made their relatively small mark on the travel industry. You can easily find these smaller sites by searching the internet. Should you list your home on these sites? That's completely up to you. Many charge much more in fees than the popular websites, so you will need to adjust your price accordingly. Personally, I would never pay an upfront fee to list my property as there are enough popular websites that are free until I rent. Many homeowners list their property on Craigslist. I would never recommend this as a good alternative to the websites listed above. While Craigslist is free and you will not be charged listing fees this website has absolutely no guarantees, insurance policies or vetting procedures. When a potential guest contacts you for booking a room it is entirely up to you to confirm their identity and determine if this person is a fit for your home. There are no other safeguards. Again, if you are providing a room for rent then you are pretty much limited to Airbnb. In addition to Airbnb, we would recommend listing entire homes on FlipKey (listing on this site will place you on TripAdvisor too) and HomeAway. Remember, though, that it takes time and effort to maintain each website; none are "set it and go." If you receive a booking from one site you must immediately block your calendar on the other websites before someone else books. This is much more important if you choose to allow instant booking of your home as you will have no warning of the reservation until after it has been made. If you cannot make the commitment to keep each website up to date then it would be better to limit yourself to the website that fits your desired clientele. If I had to choose only one website I would pick Airbnb as about 95% of our bookings come from there. However, I have also talked to other hosts who receive more bookings from HomeAway. If possible, talk to other hosts in your area to see which website is most popular where you are located.